Do you want to setup a WordPress site, but don’t own a domain name? Well you came to the right place. This article will discuss how to setup a WordPress on a VPS without a domain name just using an IP address. For this article, I will assume you have a static IP address which only you have access to, and that your IP address for your VPS is 123.456.789.0. You will obviously need to modify the IP address with your own VPS’s IP address. Also, this article assumes that your VPS runs on Debian or Ubuntu, but the steps will be fairly similar in other Linux distros. Follow the prompts, and decide on the root password for MySQL when it asks for one. After it is installed, then we can create the database and username. After installing mysql (or mariadb), you will need to actually create the specific database, username, and password for the username that you will use with your WordPress installation. **For these MySQL steps it is extremely important to be very precise, otherwise WordPress might not work properly like for example if there is a typo in your MySQL commands. First, you will need to run the MySQL command and then create a new database. For the following step, type in the root password that you setup with MySQL. The following command creates the database. We want to use UTF-8 encoding when creating the database. For the above command, I assumed our database name is exampledotcomdatabase. You can call your database whatever you want, so modify the name exampledotcomdatabase however you like. We exited mysql after creating the database just to make sure we did everything correctly. If your database that you created comes up in the output of the previous command, you know you created the database correctly. I am going to assume we will choose a username exampleusername and have its password be abcdefg12345. You can modify the username and password however you like. If you see your username, you probably created the username properly. #If you know or think you created an error with creating the database or an error with creating the username, you can easily undo the steps and then redo them. If you delete the database, make sure to recreate it with the steps above. Likewise, if you delete your username, make sure to re-create the same username or a different one because you need this with WordPress. This will automatically install any WordPress software you need without having to lookup all of the prerequisite WordPress software names. If wordpress isn’t a software available for you to install, you can just install php5, php5-mysql, libapache2-mod-php5, and that should install all necessary dependencies in Debian and Ubuntu. In order for our site to work, we need to make sure that the correct port is open, otherwise we won’t be able to access the WordPress site. I will assume that you use ufw firewall. Modify this step if you use a different firewall. Port 80 is the port that HTTP uses. We need to make sure port 80 is open. After you know that port 80 is open, we will then install our web server. Apache is the most popular web server for using WordPress. It will be the software that actually serves pages to users for your WordPress site. 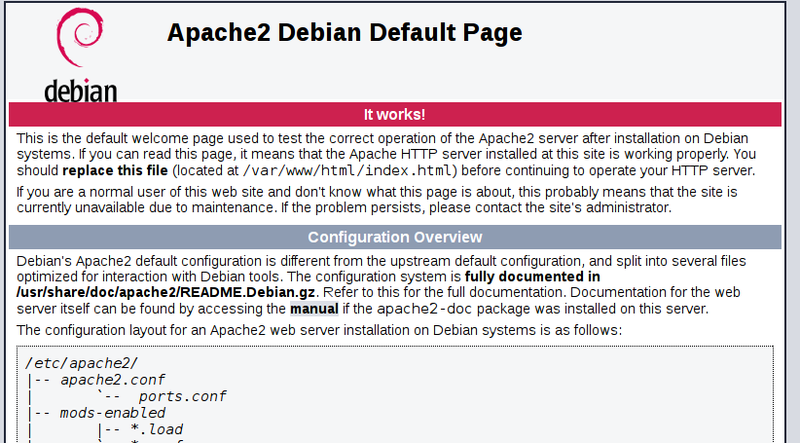 Without a web server, WordPress will not work. See picture below for an example of what you should see when you type your IP address into the address bar of your browser. This article is continued on the next page.